For as long as I can remember, I have loved gum. I remember my mom having some really good tasting gum with her all the time. She had a disease that caused muscle paralysis in her face so chewing gum after she recovered helped build back up her muscle tone. So, I was always trying to get a piece from her. She always had sugar-free gum which was better for us so she didn't mind sharing. I am sure you have all heard of the gum brand Dentyne and it has been a favorite of mine. Because I am a BzzAgent, I get the opportunity to share new products with you and today, I will be introducing you to Dentyne's brand new Split2Fit packaging! Before I continue, here is a bit more about the new Split2Fit Dentyne Gum.. 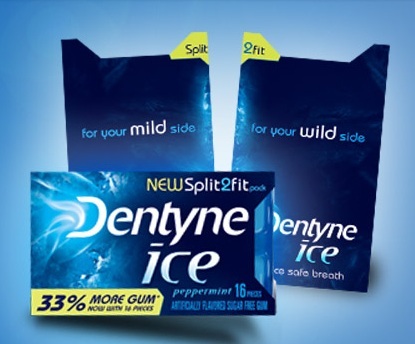 The NEW Dentyne Split2Fit pack easily splits into two sleek packs of gum that will fit almost anywhere. Shirt pocket, clutch purse, skinny jeans, fanny pack. Kidding! Definitely don't wear a fanny pack…ever. You'll be able to put your NEW Split2Fit pack almost anywhere you can think of. And hey, with Spilt2Fit packs you can keep some for yourself. Because I like to chew gum, I decided to take on this campaign and check out the all new Split2Fit Dentyne Ice! So, for this review I was sent some Split2Fit to try out and see just how easy it really is to split a pack of gum...something I have never tried to do before! Because I love to share, I was curious as to how this would work. Is is convenient? Is it trendy? Is it practical? Well, here are my thoughts. First of all, the the gum package opens like a book. There is a bit of adhesive that holds it together if you don't want to split it and also that keeps it closed if you keep it as one package. Should you decide to share with a friend, or down-size the package so it will fit compactly into a purse, pocket or diaper bag, you can separate it down the middle. I know that having a large pack of gum can be bulky so having this option is fantastic! What I don't like? The wording on the packaging and photos that I have seen on their Facebook page. I don't like the sexual innuendos that are presented by Dentyne...especially the phrase "practice safe breath" (this was just one of many that I ran across while perusing the Dentyne website). This I find unnecessary and inappropriate...especially when you are talking about something as simple as a pack of gum. That is my honest opinion and as a born-again Christian, I don't like it at all. Other than that, I love the flavors that I was sent (spearmint, arctic chill and peppermint), the wonderful taste it leaves in my mouth and the fresh breath that I have after chewing Dentyne Ice for a while! I also love the way I can easily divide a pack to make it smaller. It is very good gum but I am not sure that I want to support Dentyne after seeing what I have seen from their company in their marketing. So, in my opinion...Dentyne Split2Fit Gum is wonderful! I don't care for the marketing standards set forth by the company but the gum itself is very refreshing. Disclaimer: As a BzzAgent, I received no monetary compensation for this post. I did receive free Dentyne Split2Fit Gum and product coupons for review purposes. All thoughts and opinions are 100% mine. Stock photos and quotes are taken from the Dentyne and BzzAgent Websites. I use Trident gum now. I currently use big red and I have not heard of this kind before. I just get whatever is cheapest. I haven't heard of this before this review! I use orbit, and I havent heard of split. I use Care Free and I've never heard about Split2fit. I have never heard of Split2Fit. I presently have Trident in my purse. I currently use Orbit and yes I have heard of Dentyne Split2Fit Gum. I use Stride and I have heard of Split2fit. I have not heard of Split2Fit. I normally chew juicy fruit. I have heard about it, but have not tried it yet. Use alot of Trident or Orbit or whatever is on sale! I have not tried this yet, but my favorite kind of gum is 5 gum. I chew Trident and yes Ive heard of! I usually use Extra gum. I've heard of this but haven't tried it yet. take5 gum have not heard of Split2Fit. I just brought two of these. I had a coupon for bogo and I like it. Big Red; I have not heard of this new gum! I usually eat orbit and this is the first time i've heard of this. I have heard of this, I usually use Orbit though. I use Orbit and I have never heard of it before this. I would love to win and try this gum. I use Orbit and have not heard of it before. I use the extra desserts kind - and I have seen these but never tried it yet! I have never heard of it but I chew orbit! I've heard of it but never tried it. I normally chew 5 Gum. No, I haven't heard about it before. I chew juicy fruit and have not heard of this. I typically chew Orbit and I haven't tried Split2Fit, but I have tried Dentyne. I chew Big Red and I have not seen some commercials on this gum. I love Dentyne! Always have. But have never heard of split2fit before.